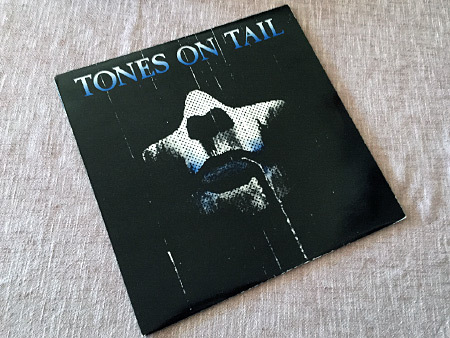 The first 12″ EP release by Tones On Tail, at the time very much the prime focus was shining on Daniel Ash as a solo project from the day job with Bauhaus. The record itself has an interesting history in that respect, with ‘Copper’ having its roots in Bauhaus, but the mix of input from both Ash and fellow Tones collaborator, Glenn Campling, who was famously at this point involved in Bauhaus in the capacity of their road crew, brings a richer variety to it all. 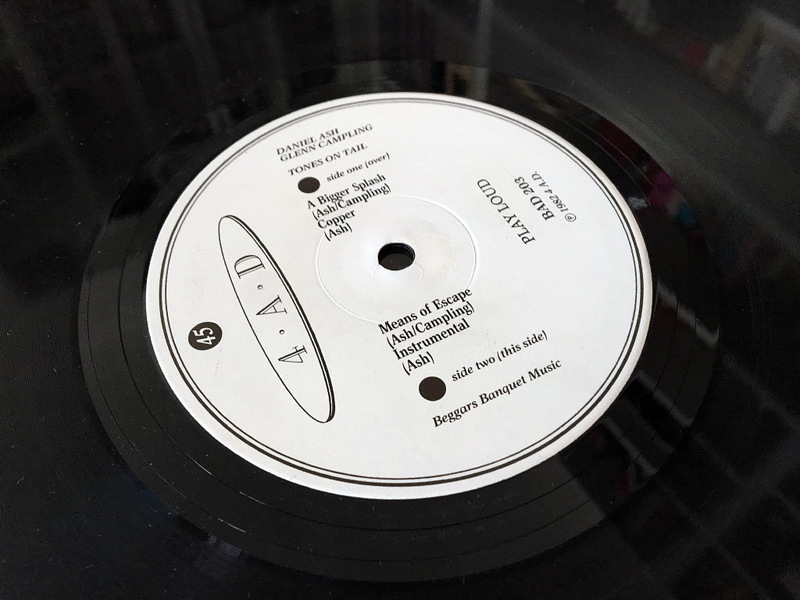 Campling’s basslines are somewhat unique on ‘A Bigger Splash’ and ‘Means of Escape’, while the record also showcases some lower end of the market rhythm boxes, long before the arrival of Kevin Haskins to the drum stool in Tones On Tail. 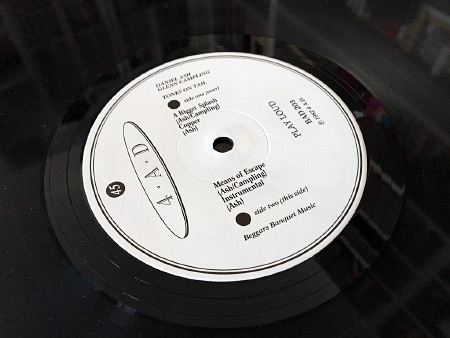 The record also established two elements that would become definitive Tones On Tail, the moody and mysterious cover painting and the use of Caslon Antique for the band logo. The opening track on side one, ‘A Bigger Splash’, is an Ash/Campling co-creation – underpinned by a busy, echo-enhanced beat, the Tensai (possibly an RCR-332 model?) 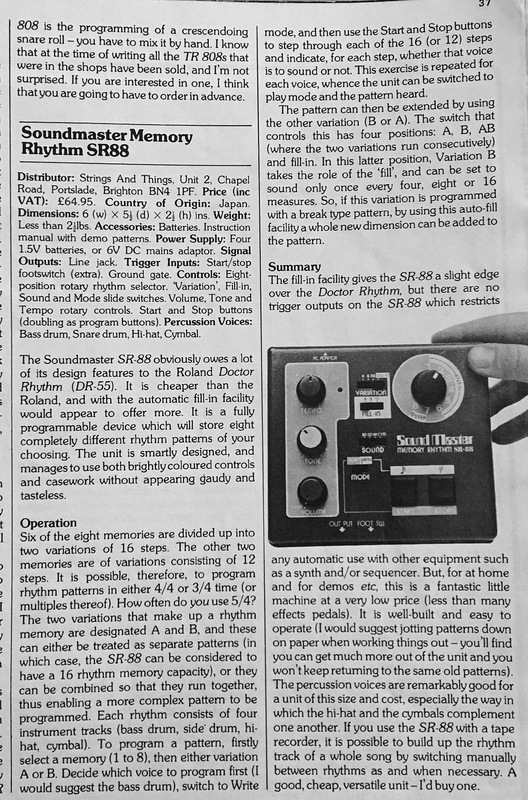 rhythm box – a weird critter of a thing that was basically a radio/tape deck boombox with built-in preset rhythm machine – sitting atop of this, Daniel Ash (presumably, since he was oft seen to do this on Bauhaus tracks such as In Fear of Fear) adds oral percussion explosions and oddness too. Adding to the foundations is Glenn Campling’s wonderful FX heavy bassline – once it starts it is pretty well off for the duration, almost machine-like itself. 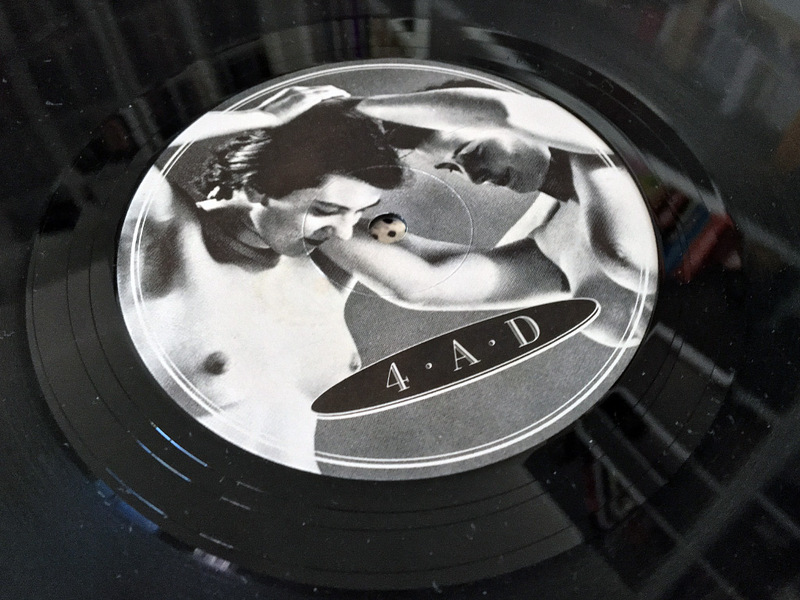 Over all of this, there is Ash’s vocals and then some fairly minimal extra instrumentation, wailing backwards guitar drifting in and out from time to time. Side one’s second track, ‘Copper’ has an interesting history to it. 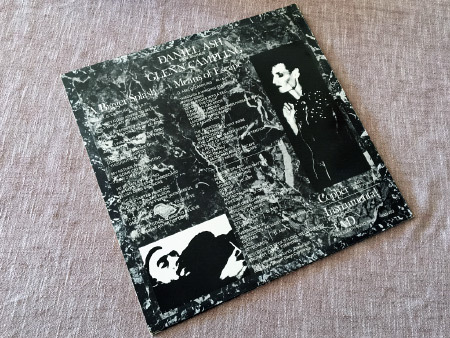 The sleeve credits note that all instruments are down to Daniel Ash, though with the combined voices of he and Campling, all somewhat manic and cackling. Side two opens with ‘Means of Escape’, where things get somewhat groovy. A strict, heavily reverbed snare and simple 4/4 rhythm box kick drum sets the bedrock of the track over which Glenn Campling once again starts up his bass guitar and proceeds as he means to go on. Over this, Daniel Ash gets the drum stick out and bows this over the guitar (a technique more famously heard on ‘Hollow Hills’ and always a sight to have seen live) layering a haunting wash of sound in and out of focus. The vocal takes the form of a quiet whisper, adding to the mystery of the lyric, while towards the end Ash adds atmospheric saxophone into the mix. Surprisingly perhaps, this only appears to have resurfaced on CD one one release, the mistakenly titled ‘Everything’ compilation. Side two and the EP ends with ‘Instrumental’ – once more, the credits list Daniel Ash responsible for all instruments, which this time comprise 12 string acoustic guitar, SoundMaster SR-88 rhythm machine, bass guitar (somewhat more basic sounding than Campling’s heavily FX-laden style) and a string synthesizer (unidentified, but customarily beautiful in sound). Perhaps to make amends though, by the time the track was dusted off again and re-issued as part of the ‘Everything’ compilation CD (and later the ‘Weird Pop’ double vinyl compilation), the original tape must have been used and instructions to fade-out before the end gone AWOL as it is unedited, so there is no fade – the instruments just die off at the end naturally. 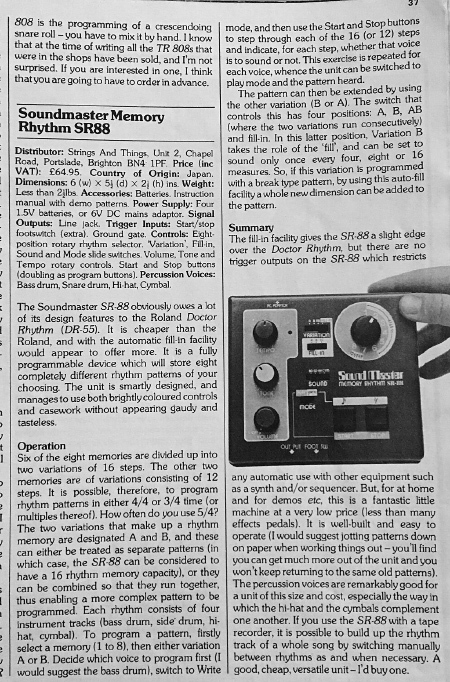 The rhythm box that underpins both ‘Means of Escape’ and ‘Instrumental’ is the Soundmaster Memory Rhythm SR-88 – I was familiar with this before the release, this is a review from the August 1981 issue of ‘Sound Internationa;’ magazine I had been poring over. This entry was posted on Monday, January 14th, 2019 at 5:00 pm	and is filed under General, Versions, versions. You can follow any responses to this entry through the RSS 2.0 feed. You can skip to the end and leave a response. Pinging is currently not allowed. A wonderful night indeed – and The Lucy Show as support! It had a video screen showing promos too that night, I remember it being the first time I had caught sight of The Cure’s promo for ‘The Caterpillar’, amongst other things.